A few days ago a lovely little email from Ultra Chloraseptic saying that they'd like to send me a pre-Christmas treat. How was I to say no? 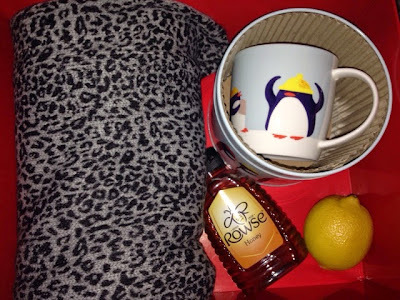 It arrived a couple of days later and I was so chuffed to find a little bundle of items that are perfect for combatting winter colds and sore throats; a gorgeous scarf, a John Lewis penguin mug, Rowse honey and a lemon. It came at the perfect time too as I am a little under the weather. THANK YOU, ULTRA CHLORASEPTIC! If you haven't heard of Ultra Chloraseptic, they are a range of anaesthetic throat sprays to relieve the pain of sore throats. Just three quick sprays can numb sore throats in seconds. It goes straight to the site of the pain so it doesn't numb your whole mouth. Ultra Chloraseptic is available in three flavours; blackcurrant, cherry and menthol. Costa's Christmas Range Launches Today!